Springtails are very small, 1/10 of an inch, and range in color from whitish to dark grey. An appendage at the end of their abdomen, which folds underneath toward the front, gives the Springtail it’s name. When disturbed or threatened Springtails use this appendage to propel themselves up and away from danger. Springtails are a common soil insect and can number as high as 50,000 per cubic foot in forest litter. Because a moist environment is required, Springtails may be found under rocks, compost piles, around swimming pools, air conditioner units, under mulch and in and under potted plants. 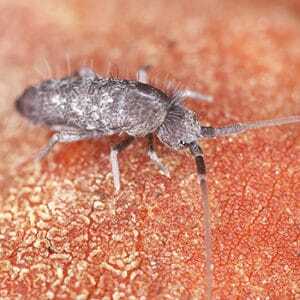 Springtails eat decaying plant matter, pollen, fungi and algae. Because Springtails cause no damage to their environment the insect itself is the only thing to look for. If found infesting inside, usually in the basement, bathroom or kitchen, it can be a sign of excessive moisture or humidity. Check for water leaks, wet moldy wood or other material and overwatered plants. Springtails may also enter structures when their environment outdoors becomes to dry. Excessive depths of mulch around a foundation will promote excessive moisture making an ideal environment for Springtails. Springtails are attracted to light and may enter homes under doors, windows, brick weep holes, utility access etc.